THE BEST TECHNOLOGY AVAILABLE ON THE MARKET! 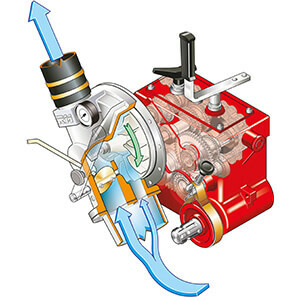 The energy required to rewind the hose is the decisive element in the economy of the self-propelled irrigation machines: The Turbine-Gearbox Assembly with in-built water By-Pass and multi-speed gearbox drastically reduces pressure losses during the irrigation cycle, thus ensuring money saving determined by less energy consumption. 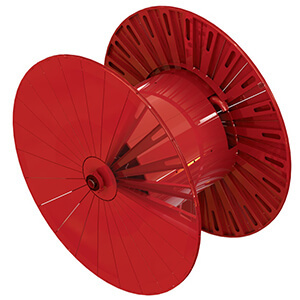 The design of the turbine impeller is the result of a cutting-edge aerodynamic calculation which allows reaching an extraordinary channeled flow of the liquid without any turbulence, thus ensuring the operation with a minimum pressure of 22 psi at the machine inlet. The quality of the Turbine-Gearbox Assembly is obtained by using a stainless-steel turbine shaft, with all bearings (including the ones in the gearbox) in oil bath. The system includes a built-in automatic brake that engages during hose unwinding and disengages during rewinding. Supported by large diameter rolling bearings to reduce friction. Protected by an interchangeable stainless-steel bushing on which lip seal rotates, thus ensuring outstanding life in the presence of aggressive fluids such as sludge. 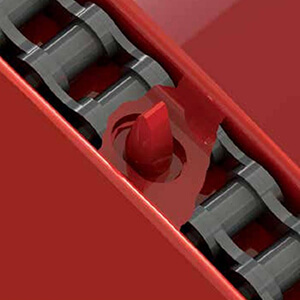 Aided maintenance: when lip seals are worn out, they can be replaced in a few minutes. This technology – an exclusive of all models – is applied to the whole range, including the smallest models. during the most difficult rewinds. Drum is fully galvanized for long life. (Except Micro and 540gx). 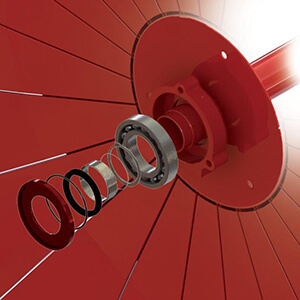 Another remarkable characteristic of our hose-reel irrigation machines: starting from the 581 Gx Evo model the drive between turbine-gearbox and reel is manufactured with high-tensile strength chain with extruded rollers. 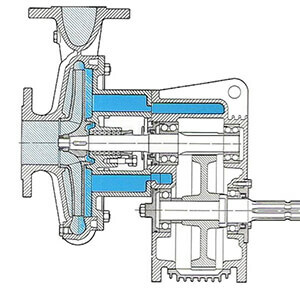 Moreover, by using the adjustable chain lug (another exclusive) located in the outer reel diameter, a very high transmission gear ratio is created between the wheel and gearbox to drastically reduce the energy absorption for rewind as well as the turning moment in the gearbox output shaft, thus insuring long life. 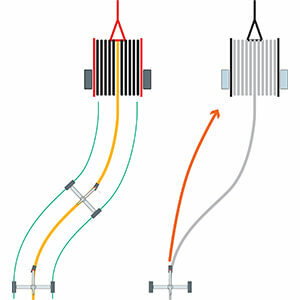 On the Major series the drive chains are located on both reel sides to cancel the torque effect of reel. 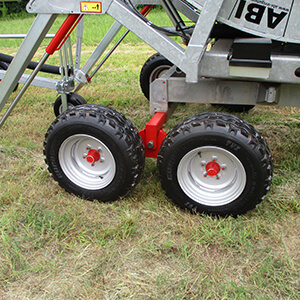 The GX Series (Except 540GX Series) trolleys are available with two pneumatic tires plus a steering tire. This wheel allows the trolley to follow the irrigation hose in the direction it was unwound (fig. 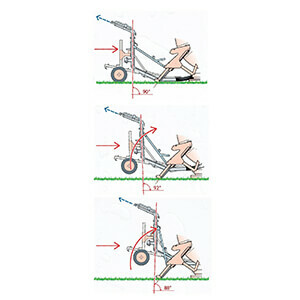 A), when being pulled it is steered by the PE hose itself, thus eliminating the typical inaccuracy of the fixed middle wheel or skids that do not follow a path so straight(fig. B). They increase the steerage and mass in the point where they are most required. Both wheels are fitted with hubs with tapering bearings and lubricator. The whole trolley structure is hot-dipped galvanized, thus ensuring an outstanding lifespan against corrosion. Starting from the 540 Gx series the sprinkler trolley stops on the ground at the end of rewind, and the following hooking and shut-off are carried out in fully automatic mode, that is, with minimal interventions by the operator. 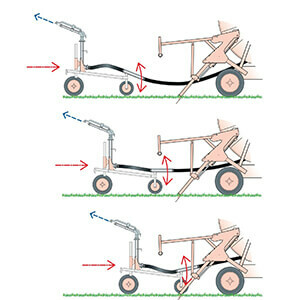 All rain gun trolleys are fitted with the pivoting hose connection to avoid any changes in the spray pattern when trolley comes close to the irrigation machine, thus maintaining the correct gun position until the end of the irrigation cycle. All the JX and JXM Series of hose reel irrigation travelers are fitted with the automatic “VertiLift™” lift of trolley during sprinkling end cycle. The exclusive progressive lifting system holds the sprinkler in a vertical position, thus making the spray pattern action effective until trolley has been lifted from the ground and correcting any drop between machine and sprinkler trolley. Standard on the 790GX, 890GX, 800JX and Major series hose reel travelers – the double axle with equal diameter wheels feature the asymmetrical rocker arm. This solution allows for a remarkable reduction in towing on rough soils, which – accompanied by a reduced side overall dimensions – also ensures a better distribution of weight during transport, thus making the machine have a greater stability. A special tested water circulation cooling system permits greater safety and permits extended life of the gearbox mechanical parts even when operating for long periods or in extreme environmental conditions.